Northeast Championship Wrestling debuted in Norwood, Massachusetts on October 5th, 2012 in front of an amazing crowd at the Norwood Elks Lodge after spending seven years in Dedham, MA and promoting NCW events throughout RI, Connecticut, and Mass. Over the last three years Norwood has become our home, and we’re proud to be a part of the community partnering with the Rhonda Julian Paint Her Pink Foundation, Papa Gino’s, Norwood Transcript, Studio TBills Salon, Broadway Pizza, and countless more. 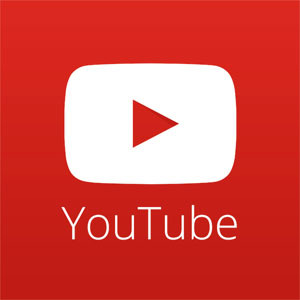 In May of 2014 NCW debuted on Norwood Public Access Television (www.npatv.org) airing @NCWTelevision, directly connecting ourselves with the community. This past summer NCW attempted to coordinate with the Norwood Civic Center to bring our year-end event WrestleFest X to the Civic Center. After speaking with the Program Director of the Recreation Department in early August we bounced back and forth for weeks with unanswered phone calls. After inquiring via e-mail about the situation we finally received a response back stating that NCW would not be “a good fit” for the town. 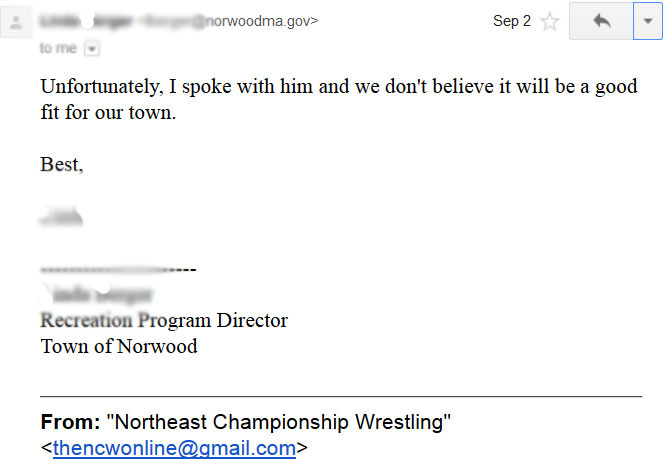 Our e-mail received from the Norwood Rec Dept. Northeast Championship Wrestling, its wrestlers, its staff, our fans who come out every month to support us, the viewers who watch us at home and follow us online, and the community as a whole respectfully disagree with this opinion. 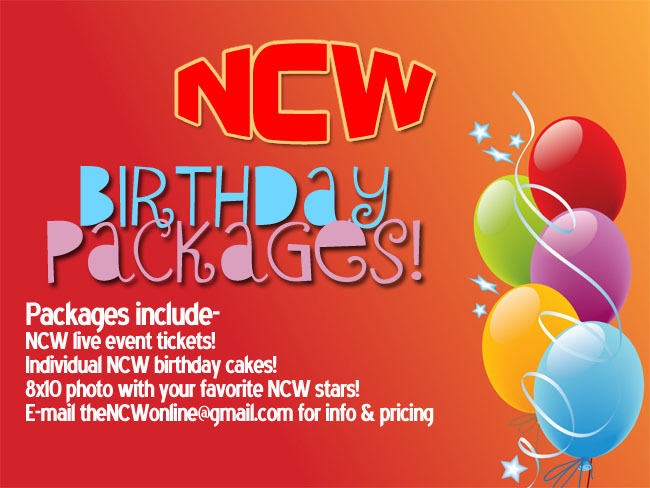 NCW is proud to be a family friendly, all ages entertainment showcase catered to wrestling fans and those who enjoy an inexpensive, unique night out unlike anything else. As we continue to partner with the incredible people at the Norwood Lodge of Elks, we plan on strengthening our bonds with the local community even more taking part in this year’s 4th of July Celebration as well as particpating in this fall’s Norwood Day. 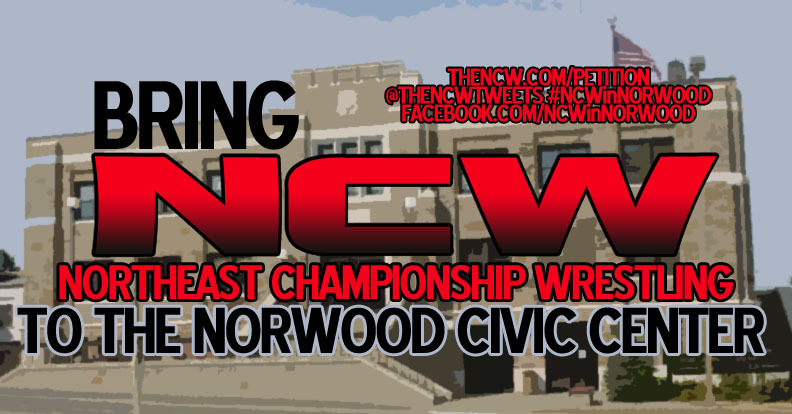 Below you’ll find an online petition where you can sign and showcase your support for NCW to the Norwood Civic Center. We feel that we have a great opportunity to bring something unique to the town and present a special NCW event like no other. We ask that you please sign and make your voice heard. Also listed is the e-mail for the Rec Department for any additional concerns. NCW will be looking for signatures additionally when we kickoff the 2015 Season February 20th at the Elks Lodge. Thank you for all your help in supporting Northeast Championship Wrestling! Bring NCW To the Civic Center, it deserves to be there.